Happy Easter everyone! I have a super kawaii outfit for you today featuring these INCREDIBLE Totoro tights from my wonderful friend Izzy. She gave them to me as a late birthday present along with a Totoro phone case and I nearly cried. As you may remember, I have the bear versions of these tights which I styled ages ago HERE. If you aren't familiar with the anime film My Neighbor Totoro, first where was your childhood and second there are some gifs and pictures from tumblr below to help (yes I put a leaf on my head deal with it). At first I was so annoyed at the rain because I couldn't take any decent pictures but then I remembered the iconic scene in the movie with the leaf and black umbrella so it worked out quite well. I even did kawaii inspired makeup and hair and I'm thinking about doing a tutorial on my youtube soon. Those tights are MEGA RAD, but also the fact that you took all the pictures in a super totoro style- thing, is just beyond cool. I absolutely love this so much. My neighbour Totoro is one of my favourite movies eves, but I adore all the studio ghibli movies, escpecially Kiki's delivery service. Just pure awesome. Do you watch an tv anime? Like fullmetal, or, dare I say it, Ouran Highschool Host Club, the best show ever? 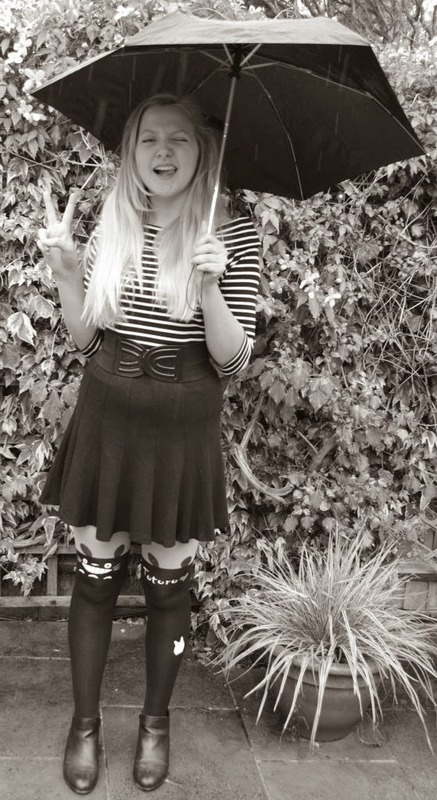 Love this look, you look so adorable :) Your tights are so cute! !